MUMBAI, India/ AMSTERDAM, Netherlands, 2017-Nov-30 — /Travel PR News/ — Jet Airways Cargo (9W Cargo) and Air France KLM Cargo (AFKL Cargo) have announced that they have signed a Memorandum of Understanding (MoU) with the objective to shape and further strengthen their existing cargo cooperation. The signing of the MoU is especially significant, as it complements the positive developments that have been evolving on the passenger side of the business via the ongoing codeshare agreements between the partner carriers. Since the beginning of the codeshare agreements on the passenger side, the combined cargo handled by the partners has more than tripled during the period and continues to evolve. Under the scope of the MoU that seeks to deepen the cooperation between the partners, both parties will endeavour to link and leverage their respective route networks in order to enable them to create and offer expanded high-value cargo services, as well as new and innovative products tailored towards the needs of specific industries such as Pharmaceuticals, Express and E-commerce, aside from individual clients. The MoU will enable the partners to offer a comprehensive set of higher value services that are complementary including those on high frequency routes as well as bringing in new and unique destinations into the servicing framework via their respective hubs and gateways, both in India (Mumbai and Delhi) and in France (Paris-Charles de Gaulle) and The Netherlands (Amsterdam Schiphol). With the aim of eventually creating an integrated commercial and operational cargo cooperation model between India and Europe, the partners will work through several steps that will comprise synergising their respective cargo networks, bringing in efficiencies in warehousing, exchanging capacities and making blocked space arrangements. 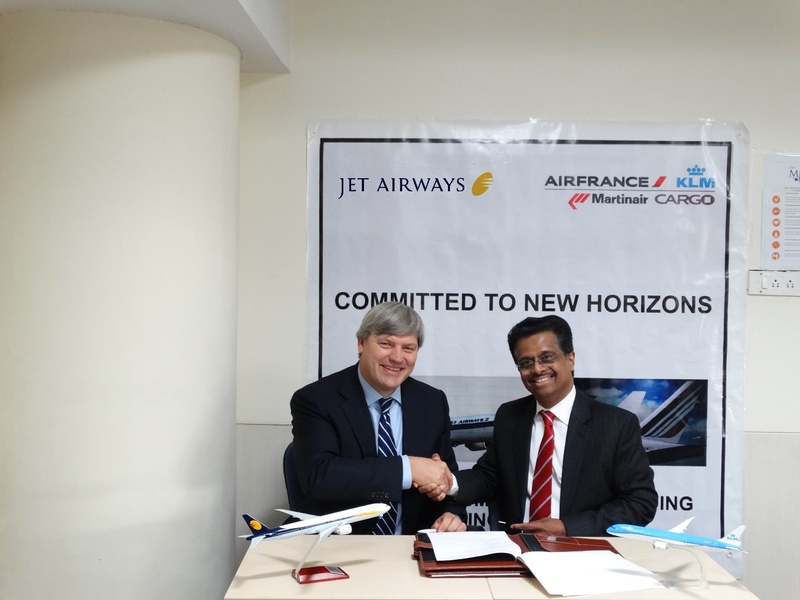 Jet Airways Cargo and Air France KLM Cargo will also collaborate to optimise and expand volumes from emerging Indian markets such as Bengaluru and Chennai where intercontinental connectivity by direct services has recently been enabled. Air France KLM is the leading group in international air traffic from its hubs Paris Charles de Gaulle (CDG) and Amsterdam Airport Schiphol (AMS), which are ranked among the Top Three European cargo hubs. With a fleet of 534 aircraft and 93.4 million passengers carried in 2016, Air France KLM provides service to 320 destinations in 114 countries. AIR FRANCE KLM MARTINAIR Cargo is the Air France KLM Group’s dedicated air cargo business. Our three airlines offer the industry more than a thousand weekly frequencies to 127 destinations. In 2016, AIR FRANCE KLM MARTINAIR Cargo transported 1.1 million tonnes of cargo. In addition to the Group’s global network of passenger aircraft, we offer cargo main deck capacity on two Boeing 777 Freighters, four Boeing 747-400 Freighters and nine Boeing 747-400 Combi aircraft. In 2016, Air France Cargo and KLM Cargo and our hubs (CDG and AMS) obtained the IATA CEIV certification, providing service excellence to the pharmaceutical industry. Air France KLM Cargo is a member of SkyTeam Cargo (www.skyteamcargo.com) offering an even larger network coverage. Special partnerships include Air Mauritius Cargo, Alitalia Cargo, China Southern Cargo, Delta Cargo, Kenya Airways Cargo and Jet Airways Cargo. For more information about AIR FRANCE KLM MARTINAIR Cargo, please visit www.afklcargo.com. Jet Airways is India’s premier international airline which operates flights to 64 destinations, including India and overseas. Jet Airways’ robust domestic India network spans the length and breadth of the country covering metro cities, state capitals and emerging destinations. Beyond India, Jet Airways operates flights to key international destinations in South East Asia, South Asia, Middle East, Europe and North America. The Jet Airways Group currently operates a fleet of 115 aircraft, comprising Boeing 777-300 ERs, Airbus A330-200/300, Next Generation Boeing 737s and ATR 72-500/600s. This entry was posted in Airlines, Business, Flights, Transportation, Travel, Travel Management, Travel Services and tagged Air France KLM Cargo, cargo cooperation, Jet Airways Cargo, Marcel de Nooijer, Pradeep Kumar Sr.. Bookmark the permalink.